I’m seeing a lot of headlines roll by lately about cyclists getting killed, and it’s making me really upset. I applaud your efforts to make Boston a friendlier city for cyclists and pedestrians. But…there’s so much more to be done, especially now that we’ve reached this critical juncture: As more of us ride around, and even more of us think about riding, what’s next? Women cyclists are what’s next. Make it safer for women and children to ride, and the quality of life will improve city-wide. I’d like to live in a city where I wouldn’t feel afraid the moment before I get on my bike. Where my young son and I wouldn’t be afraid that we might be killed or badly hurt because we chose to run an errand in our neighborhood by bike. Almost every day, we choose to ride or walk instead of drive. My son usually insists that we go by bike, actually, and I don’t want to discourage him. In spite of my fear, I still choose to ride. Because I don’t want this fear to control my life. Because my son and I love to ride—it’s fun! Because we choose to be healthy. Because riding a bike is so convenient. And because by riding our bikes, we’re choosing to do something, even though it’s a small something, to help save our beautiful planet. My son and I also walk, and take the T. I drive a car, too, but prefer not to if I don’t have to. Why should I, if I live in a city? Please, Mr. Mayor: Make it easier for me to bike than drive! If a 28-year old woman, a Barnard/BC grad student about to embark on a promising career, was shot and killed on Huntington Avenue, it would be front page news. But if she gets killed while riding her bike? Meh! How many of us have to die cycling before we do something to change the status quo? 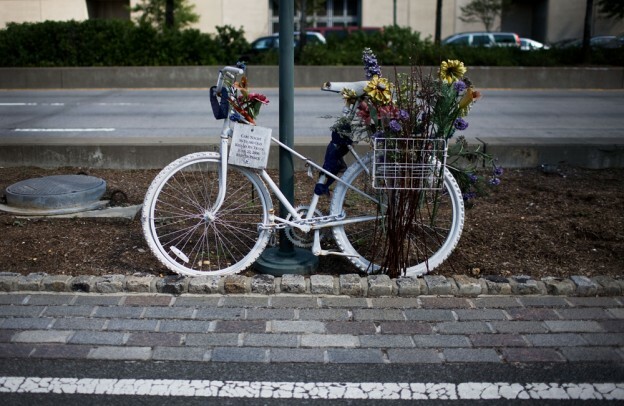 The ghost bike phenomenon was swirling around quite a bit in the news this past week. How many more memorials will go up this year? Seriously, Mr. Mayor: Don’t you think it’s time we did even more to make it safer to get around town without a car? That we did something, right now, to make our children healthier and happier? Something that would be visionary, and yet so simple? Something that would be a truly lasting legacy of your administration? How long must we wait before we get separated bike lanes on Boylston? There’s plenty of room. How about a car-free zone on Newbury, where most of the traffic is just cruising around, looking for parking anyway? Let’s be innovative. We live in a beautiful, intelligent, creative city! Mayor Menino, if you really want more women and families to ride bikes, like you say you do on your BostonBikes Facebook page, then set up a robust bike infrastructure throughout the city, so women and children aren’t scared to death to ride. Because that’s why we ride on sidewalks. That’s why we do Idaho stops (click on the link — we should make this the law! )—which is when we stop, then go once it’s safe. Because we need room to ride. We need our own designated space to feel safe enough to ride, even with our children. We need separate traffic signals to navigate busy intersections, separated lanes, and separate road rules, because bikes are not the same as cars. If cyclists stop, then go ahead at a light, we do it because it’s safer for us to have a head start. Once the infrastructure’s there, you’ll find more compliance with the rules, and drivers, pedestrians, and cyclists will all be safer. Go to Amsterdam, to Copenhagen, or any other inspiring world-class city, and you’ll see firsthand what I mean. People deserve a distinct and safe space on the street when they get around on bikes (or on foot), just as much as when they’re in cars. Remember you once said: “The car is no longer king“? 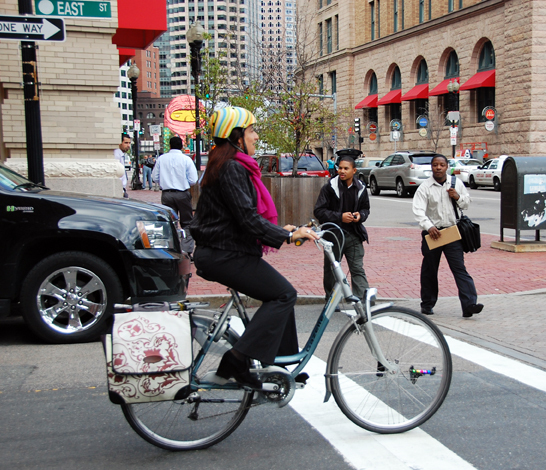 Make women cyclists the queens, and see how truly great a city Boston could be. Keep the wheels turning and the keyboard grooving. Well done. hey Michele! Good for you. I’m really hoping it’s not nearly so scary in the near-distant future. Wouldn’t that be incredible? It’s been done before in plenty of other places! Well done. You should be the queen of this task force. Charging a meaty consulting fee, of course! I’m not trying to sound sexist, but how does being a woman affect bike riding safety in any way? It sounds like you’re just trying to cram a feminist sentiment in where there really doesn’t need to be one. It’s not so much that there needs to be more women cyclists to meet some kind of arbitrary gender quota. It’s that in cities like Copenhagen and Amsterdam which are kind of the “gold standard” for bicycling infrastructure, women bicyclists tend to outnumber men. The theory is that if women aren’t willing to bike in your city, it must mean that people feel like they’re taking their lives in their hands when they get on a bike. Or to put it more cynically: Most daredevils tend to be men, so if only men are biking in your city, it’s probably an indication that only the daredevils are biking. So the goal is to improve bicycle safety overall, and the number of women biking is a pretty reliable metric of how good a job we’re doing. hi Eric, thanks for jumping in. Tired of people with an outdated mindset who just hate on cyclists and/or don’t get why safe cycling infrastructure is so important for everyone (not just cyclists and…not just women). If women feel safe enough to ride with their children on the streets of Boston, then chances are everyone else will, too. It really is as simple as that. Take care & ride safely. It’s not that there aren’t plenty of men out there who are also not biking because they aren’t daredevils, it’s just that when you only see men (especially men under 30 with bike-related tattoos! ), it’s much more obvious that you have a problem. I will say there are plenty of women riding around out there, just not enough. I’ll know we’ve reached the mountaintop when people stop gasping in amazement that I ride around in business attire — or that I ride around at all! Because there won’t be this “us” vs. “them” mentality – everyone will ride for utility and for fun, because everyone feels so safe about doing it, they don’t think twice about it. I like what you are saying. I used to ride everywhere a decade ago and I gave it up when I was pregnant. I felt unsafe and I felt that it was irresponsible of me to continue to ride. I’m back out there now, with my nine year old with me. I think the city is a different place now for bikers. The dedicated bike lanes have changed the environment significantly. The rules on the T have changed, but more than that, the attitude towards cyclists has softened, particularly on the T but in many places. We can all chip in. When we ride, we should be respectful of pedestrians, of other riders, of other passengers on the T when we come on with our bike. We should be enthusiastic about our experiences. We should lead by example. I know that cycling can be dangerous. I see those ghost bikes, too, and they do give me pause. But I don’t feel it in the same way that I felt it ten years ago. I feel safer. I applaud the Menino administration for their work and I look forward to seeing what the city feels like in ten more years. As a guy who bikes around here, and grew up biking here and in NYC… I used to be a daredevil biker and now I’m not. It’s much safer here than it used to be, and I ride more safely now – more like a car, and also often slower – whether I’m towing my kids or not. I agree with everything you said. And I’d like to see it become safer here. Toward that end, as someone who lived in a city with great bike infrastructure and respect for biking – I’d like to see us do more. For instance: educate police and all drivers about the rights of bikers, and tell cops to stop telling bikers that they can’t ticket a car driver because they (the cop) didn’t see the accident – they don’t say that to a motorist; close streets to car through-traffic (allowing local traffic but with posts at one end of each block); make more bike paths, bike lanes, and cycletracks (not all cyclists like them, but I loved them); create preferential traffic lights for bikes. Thank you for writing this. As a woman and bike commuter I appreciate and agree with all of your points. However, the one thing I think about on a daily basis is Idaho stops. I’m tired of being yelled at for going against a red light (after I’ve checked to make sure it’s safe of course) when 100% of the time I’m doing it because it makes me feel infinitely safer than being next to cars that won’t signal their right turns, don’t see me, or are trying to box me out of their…ahem our….lane. I agree that when more women bike it encourages others to try it too and that it means the standard of safety is higher. But I think it’d make a huge difference for the safety of all if there was a big push for Idaho Stop legislation that includes educating cyclists and especially drivers as to what that means. Hi Jessica – thanks for reading, and for commenting. Typing this on my phone so bear with me. I, too, am tired of getting yelled at by aggressive dudes in spandex when I stop, then go (Idaho stop). I mention the need for the Idaho stop in my post (also see link). Since writing this last month, I also think it would be great to have kids learn some cycling etiquette and road rules — in fact I’m trying to arrange for MassBike to come and teach the 5th graders at my son’s school. But adult cyclists could benefit from something like this, too. Take care, be safe out there. I’m a 62 year old woman (Eric’s mom) who lives in Newton. Back in the 70s when I lived in Cambridge my husband and I biked everywhere. Then one fall evening after the clocks changed I was riding home from work in rush hour traffic on Mass Ave and I got hit by a car pulling out of a side street. Although I escaped serious injury it put me off cycling for a long time. Recently I’m back on a bike again. I love being able to bike around town for errands and on weekends my husband and I like to ride on some of our wonderful bike trails. When I went back to biking I started doing it on the trails because it seemed safer. Now I cautiously ride in traffic. Maybe getting women out on the trails is a way to get them comfortable with riding, plus it’s great exercise and lots of fun. hi Linda – thanks for commenting. I’m sorry that happened to you. Ugh! Riding on trails is a great first step to get people feeling confident and comfortable about riding again. I rode past an older woman the other day and she smiled at me and said, “You make it look so easy!” It made me realize how freaked out I felt when I first stared riding in the city, and how much more comfortable I feel now, even though I still always feel scared before I hop on to go somewhere–especially if I’m riding with my son. Hopefully this will change for the better SOON. Take care, hope to see you on your bike out there! Hi Jennifer, would like to discuss this tonight for a piece on bike safety. Can you drop me a line?